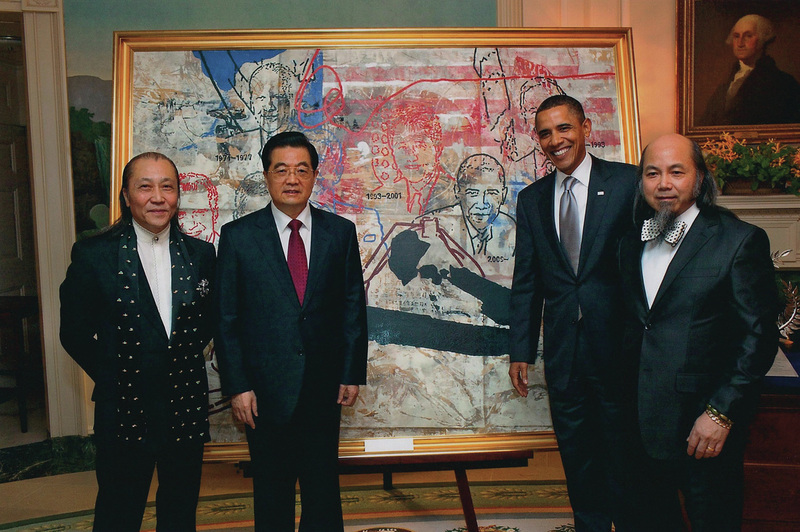 ​In honor of President Hu’s State Visit, President Obama presented the Chinese leader with a painting created by the Zhou Brothers. 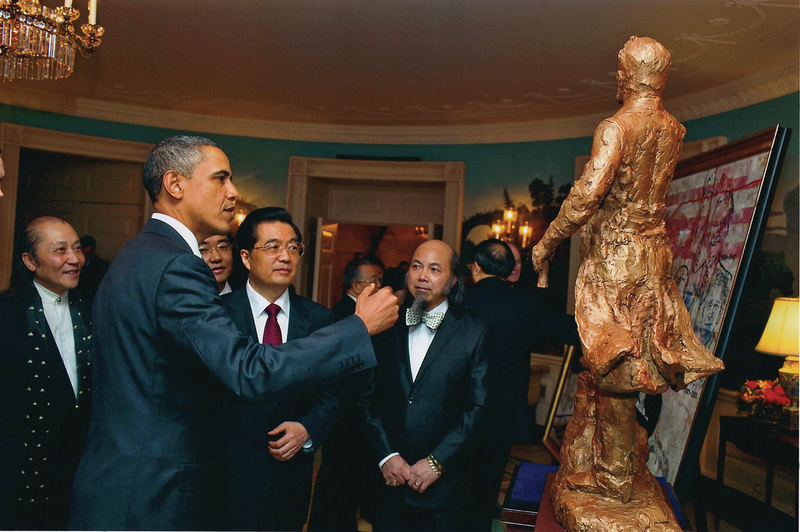 Based in President Obama’s hometown of Chicago, Illinois, DaHuang and ShanZuo Zhou are distinguished Chinese American contemporary artists known for their unique collaborative work process. Their thinking, aesthetic and creativity are a symbiosis of Eastern and Western philosophy. It’s an original multi-textural oil painting on canvas measuring 86 inches wide and 68 inches high – 8 and 6 are lucky numbers that coincide with China’s country code 86. From the Great Wall of China to the portraits of the eight U.S. Presidents since President Nixon’s historic trip to China in 1972, the painting is replete with imagery and motifs that represent 5,000 years of Chinese culture and the friendship that our two countries have shared and will continue on together into the future. The Zhou Brothers are amongst the most accomplished contemporary artists in the world today, renowned for their unique collaborative process. They work together on each painting, performance, sculpture, and print, often communicating in a dream dialogue. The Brothers’ thinking, aesthetic, and creativity are a synthesis of Eastern and Western philosophy, art, and literature that has informed their development since early childhood. Their indomitable spirit allowed them to leave behind their brilliant success in China and step onto the world stage. The Brothers have since achieved international acclaim while continuing to work in the West. The Zhou Brothers, ShanZuo and DaHuang Zhou, were born in China in 1952 and 1957 respectively. They studied drama and painting at the University of Shanghai from 1978 to 1982 and the National Academy for Arts and Crafts in Beijing from 1983 to 1984 where they received their MFAs. In the 1980s they became leaders of the contemporary art movement in China. In 1985 they won the National Prize of the Chinese Avant-Garde of the Ministry of Culture and the Prize for Creativity from the Peace Corps of the United Nations. They were also honored as the first contemporary artists ever to show their work in an exhibition that traveled to the five largest museums in China, including the National Art Museum of China in Beijing. Realizing that the political and cultural landscape at that time would not allow them to expand their careers, an invitation to exhibit in Chicago in 1986 presented a timely opportunity to make the transition to an international stage. The Zhou Brothers have consequently maintained their home and studios in Chicago while actively exhibiting their work nationally and abroad. They have held guest professorships at the International Academy for Art and Design at the Fachhochschule in Hamburg, Germany; The Summer Academy of Art in Salzburg, Austria; The Summer Academy of Art in Traunkirchen, Austria; and The Art Academy in Bad Reichenholl, Germany. They received one of the most prestigious fine art awards, The Haitland Foundation Award, Germany, 1996. The most important demonstration of their collaboration is the performance the Zhou Brothers gave during the opening ceremony of the World Economic Forum in Davos, Switzerland, in 2000. In front of the most important political, economic, and cultural leaders in the world, they created a large-format painting titled New Beginnings to give due treatment to their most important theme, humankind. ​Their work has been documented in various books and catalogues and has been collected by private and public institutions world wide. A retrospective exhibition “Zhou Brothers: 30 Years of Collaboration” was organized by the Elmhurst Art Museum and the Chicago Department of Cultural Affairs on October 2004. 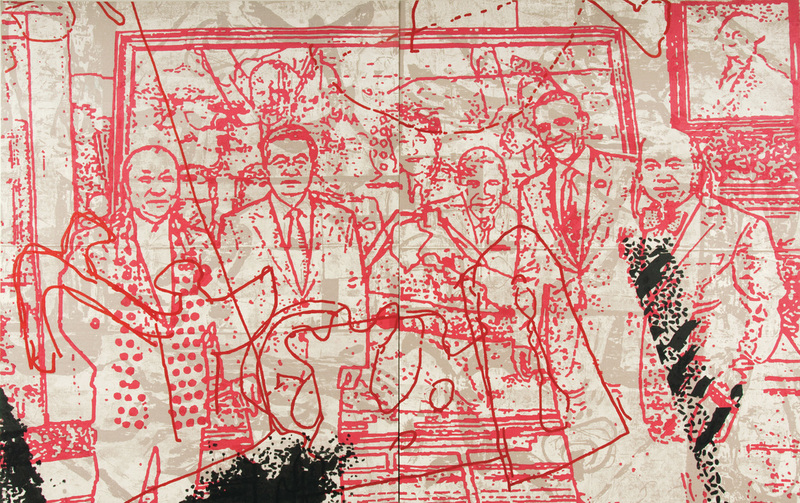 Zhou Brothers: 30 Years of Collaboration includes artwork from three major periods of the brothers’ collaboration: China (1973 – 1985), America (1986 – 1993) and Europe and America (1994 – 2003).